A hundred years ago, Govan women showed the world how powerful they were together. While the workers were risking their lives at the front, or their health in the munitions factories of the First World War, the landlords tried to milk more profit by increasing rents in their ill-maintained tenements. But the women were not having any of that! They didn’t have the vote yet, but they had courage and each other’s backs when they said – We are not removing! 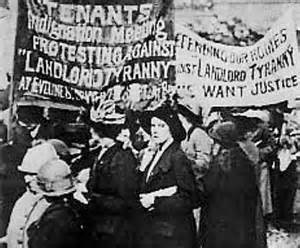 The 1915 rent strikes, which started in Govan but spread to other parts of Clydeside, are a famous victory in the ongoing struggle for fair, affordable, and decent housing. As the state tried to stir up war fever, the rent strikers took inspiration from those resisting militarism and imperialism, striving for international working class solidarity instead. Please join us for a screening of two key films about this history and about the women who made it happen, and for a conversation about the many ways in which this struggle lives on. When this film was made, the importance of women in the history of social struggles on the Clyde had been all but forgotten. The filmmakers bring this history out of the archives through interviews with Govan women who knew Mary Barbour, Helen Crawfurd, and Agnes Dollan. Hear how the sheriff officers got chucked into the midden and how the tenement back courts echoed with radical ideas! Twenty-seven years after the original film was made, Govan women reflect on their lives and roles by the Clyde in a unique collaborative women’s history film project led by filmmaker, Kirsten MacLeod, in association with Plantation Productions and the University of the West of Scotland. There will be some time and refreshments between the films for anyone interested in the rent strikes centenary or in contemporary housing issues to meet and chat. A free creche will be available in a separate room, run by skilled childcare workers. Please contact the organisers to ensure there are enough places.